Today we’ll show you how to make a pencil case! Because a creative desk means pencils, scissors and markers everywhere. So: a pencil case always comes in handy. And how cool is it that you can easily make a pencil case from your own pattern printed on fabric? Also, keep on reading for a nice giveaway. * Fabric for the outside (40 x 26 cm). 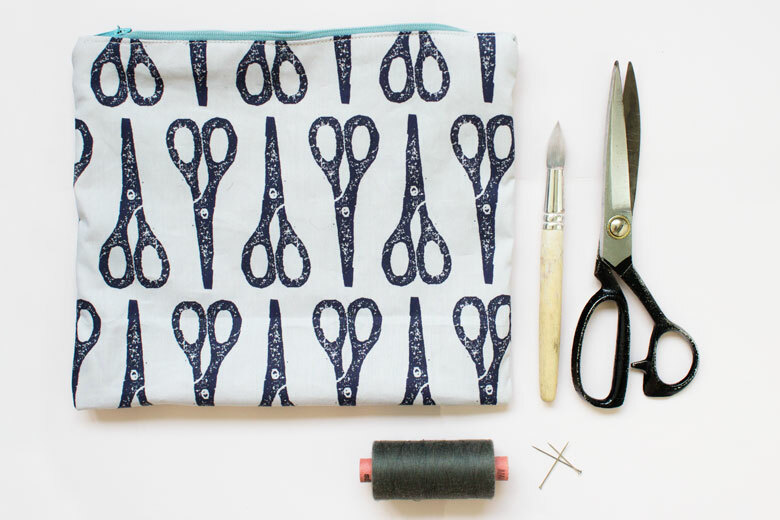 We chose the Cotton Basic fabric with the fun scissors-pattern by SaskiaYda. Of course you can also upload your own pattern at Motiflow and print this one on fabric! * Fabric for the inside (40 x 26 cm). We advise to use two pieces of fabric, so one for the outside and one for the inside. This way the pencil case will be more stiff. We chose a plain color pink, but you can go all the way; for example by choosing another print for the inside! * Zipper (18,5 cm). Choose for example a color that is in contrast with the pattern! Well begun is half done, so make sure you have all materials arranged. Sew a piece of fabric on both sides of the zipper (2). This way you make the zipper a bit longer, which makes the finishing way easier. We used a piece of fabric from 4x8cm and fold this piece (so you have 4x4cm). Sew this piece of fabric on the zipper. This way you also make the zipper steady. This is important because you open and close the zipper a lot, so here will be the most movement. The zipper is now ready, so it’s to move on to the fabrics. We used the scissors-fabric for the outside of the pencil case and the pink one as inside fabric. Lay the outside fabric on the inside fabric with the printed side up. Eventually you will fold this fabric. Put the zipper on the side that will be zipped up. This side as well as the side across have to be folded 1 centimeter. These are the sides that the zipper will be attached to. So these have to be solid and furthermore the edges will not fray. The zipper has to be attached to the folded sides. Start with pinning the first folded side to the zipper. Next you turnover the fabric and fold it, so the next folded side can be pinned to the zipper. Is the zipper pinned solid and at the right spot? Than you can sew the zipper to both sides. Your pencil case is almost finished! Only both sides are still open, which of course isn't that handy 😉 Turn the pencil case inside out, so you will not see fringes on the outside. PAY ATTENTION! keep the zipper a little bit open when you turn it inside out, otherwise you can not turn it back again after you sew the sides. 6. Yay, we’re almost there! Tadaa, your self-made pencil is done! Nice, isn't it? Order the scissors fabric here! The fun part about making a pencil case yourself is that you can make it completely in your own style. You don’t need a lot of gear and the only thing you might need to buy is a piece of fabric and a zipper. At Motiflow you can already buy a piece of fabric (Cotton Basic, 50 x 100cm) from 7,99, where you can easily get enough fabric out for a pencil case. Even with your own design.. so for 7,99 you can make your own, personal, unique pencil case! Also nice to give as a present. The theme of this month’s blog is creative desk. But instead of a pencil case, you can also make a nice toilet bag! And since it’s the middle of the vacation; also nice (and handy) to take on your trip. For the inside of the toilet bag you can choose the Poly Outdoor fabric. This fabric is water-resistant, and therefore ideal for your make-up! Next month we will tell you more about this fabric. Want to make this DIY? 5. And win the fabric needed for this DIY with your favourite print! At the end of the month we'll announce the winner. Are you going to make this DIY? Than share it with#diymotiflow. Than you can share, like and see your creations. We like!